Image and concept borrowed from the amazing Bonnie creator of the best spanking blog ever My Bottom Smarts. Personally I don’t know about loving lurkers but I think I can say without reservation that there are quite a few of you that I wouldn’t mind spanking, the line forms to the right. This entry was posted in Mostly true life experience. Bookmark the permalink. 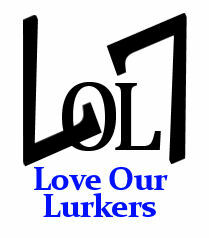 14 Responses to Love Our Lurkers! Happy LOL 7 day! I’m a regular visitor to your blog, and always enjoy your posts. Thank you for stopping by I am happy that you enjoy my blog. I have commented here before but have a great LOL Day anyway. I still get a special thrill from the sub title of your blog, always makes me smile. Huh. Normally you get coffee and biscuits. How did you manage all that smoke and mist, I am totally impressed. We have already read “Late Bloomer”, but Happy LOL. I have considered this and If I pick out your name you can purchase any book you like or I can suggest an alternate. 5 comments on one post I may just have to lie down. I think I need a spanking for not stopping by yesterday to wish you a Happy LOL Day. I don’t always comment but enjoy my visits. Maybe a spanking is in order. Please put in my request to your hubbie, then you can tell us all about it. Happy LOL Day. We’re fans of your blog, though don’t comment near often enough.